Get the kids outside and away from their screens to play classic croquet with four wooden animal buddies. Grab the kiddos and this fun-loving menagerie for a wild (animal) game of backyard croquet. A fun, easy activity that will make them forget all about their electronic screens, it helps with motor skills and hand-eye coordination, and teaches them to be a good sport. 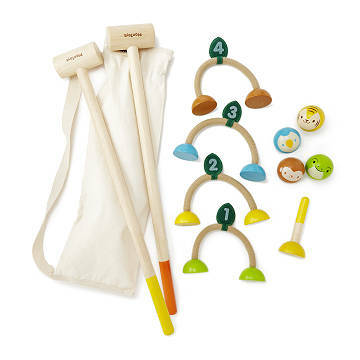 The set includes four different animal balls—bird, tiger, monkey and frog—two mallets, four soft rope wickets, and one final stand. Made in Thailand of sustainably harvested wood with a non-toxic finish.